From left, Munroe-Meyer Institute Director Karoly Mirnics, M.D., Ph.D., Omaha Mayor Jean Stothert, Council Bluffs Mayor Matt Walsh and Autism Action Partnership Executive Director Justin Dougherty at the "Light It Up Blue" event April 2. 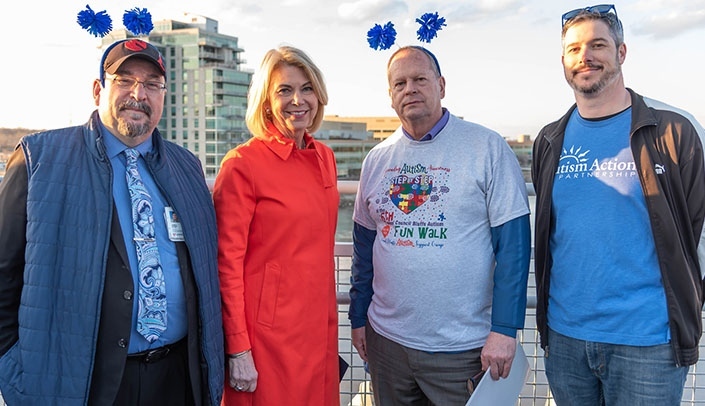 Omaha Mayor Jean Stothert and Council Bluffs Mayor Matt Walsh joined leaders from the Munroe-Meyer Institute (MMI) and Autism Action Partnership at the Bob Kerrey Pedestrian Bridge on April 2 to mark World Autism Day and see the bridge be lit up blue for autism awareness. World Autism Day is an international event to encourage all to "Light It Up Blue" to promote awareness and advocacy for families living with autism. "I believe that we are making a difference. You are making a difference today," Karoly Mirnics, M.D., Ph.D., director of MMI, told the crowd. See a photo album from the event. Approximately 300 people, from both the Nebraska and Council Bluffs sides of the river, took to the bridge to meet in the middle -- a symbol, Dr. Mirnics said, of connection. "This is what society is about," Dr. Mirnics said. "Societies care. Societies band together for a worthy cause. The bridge is a symbol of this connection, connecting cities, connecting people, and that's why it is the right place to be together. "This is an amazing partnership, between families, patients, providers, public officials, philanthropists -- everyone in the community has to do their part." Creighton mascot Billy Bluejay, the Unified Cheer Squads from Elkhorn South and Millard South, United Healthcare's Health E. Hound, and Stormy, the Omaha Storm Chasers' mascot were on hand to mingle and take photos with the crowd. A representative from WhyArts brought a puppet from its "Kids on the Block" program. Stothert read a proclamation declaring April 2 Autism Awareness Day, while Walsh, who also had a proclamation, thanked the crowd for coming out to show support. "Autism is one of the fastest growing developmental disabilities in the world, affecting over 3.5 million Americans, including persons within our Omaha family," Stothert said. "Our Omaha community supports increased awareness of autism." Stothert also commended UNMC, the Munroe-Meyer Institute and Autism Action Partnership "for their support for individuals with autism. They bring vital information to the community and to parents who have children with autism and other disabilities." Autism Action Partnership Executive Director Justin Dougherty thanked Mayors Stothert and Walsh, as well as all the members of the crowd, for attending. "This is World Autism Day, and it's also Autism Month, so we have 20-plus more days to celebrate and to make sure everyone knows who we are and how we are," he said. The tower lights on the bridge glowed blue at 7:19 p.m. They will continue to "light it up blue" throughout the month. The bridge was one of a number of regional, national and international landmarks that were lit blue on April 2. In Omaha, the Henry Doorly Zoo's Desert Dome, MMI, the Woodmen of the World Tower, and UNMC's Hope Tower and walkways at 42nd Street and Farnam Street, also lit up blue to mark the day.